Weighs in pounds, ounces, kilograms, or grams! Globe brings you a compact, portable, and digital scale that measures up to the test! 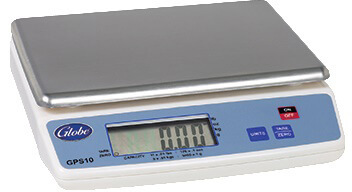 This scale can measure in multiple modes including pounds, ounces, kilograms, or grams! This scale makes weighing and portioning your food easy with a push of a button. This scale is wireless and is battery powered so no more worrying about an outlet, you can food prep anywhere! The low battery indicator will alert you when it's time to change out batteries so that you are always prepared. Whether you are weighing dough for some delicious pizza crust or portioning out deli meats, you can count on Globe for quality food prepping equipment!